The Solar Foundation’s 2018 Jobs Census found that California lost 9,500 solar jobs in 2018, the second year in a row of job loss for the state’s most promising clean energy market. Link to report here. The job losses track the decline in California's annual solar installations that went from 1.3 megawatts (MW) in 2016 to approximately 1.2 MW in both 2017 and 2018 for distributed solar energy installations (source: DG Stats database based on utility interconnection data). The state also experienced a sharp decline in demand for utility scale solar projects during this time. 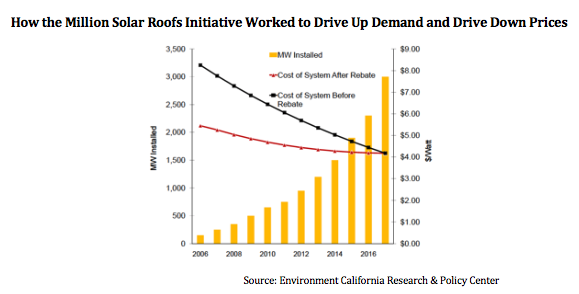 California’s solar market decline is due almost entirely to policy changes at the state level including modifications in investor-owned and publicly-owned utility net energy metering policies as well as changes to rate structures that have been designed to be less solar friendly. In addition, persistent utility interconnection barriers and permitting red tape continue to drag the California solar market, causing delays and added costs and slowing down the consumer adoption of solar energy and energy storage. As the state deepens its commitment to clean energy on paper, establishing a 100% clean energy goal by 2045 in 2018, it has simultaneously weakened foundational policies that support local clean energy markets. If California hopes to lead the nation and the world in realizing a clean energy future it must maintain strong policies that allow local renewable energy technologies to compete and thrive. Looking ahead, countervailing winds driving future growth are on the horizon including the state’s new solar homes mandate as well as incentives for energy storage. Neither of these initiates, however, will result in added jobs if the underlying solar market continues to be undermined by state and local policies. Furthermore, marked growth from these initiatives is not expected until mid-2020. Despite the decline in the solar market and resulting job loss over the past two years, California’s solar industry still employs more people than the state’s traditional fossil fuel-oriented utilities combined. Solar energy is a job-intensive technology creating more jobs per unit of energy generated than conventional resources. These jobs are community-based and cannot be outsourced. Building solar is good for our environment and good for our local economies as well. For more information, contact Bernadette Del Chiaro at 916-765-3224 or bernadette@calssa.org. Sacramento – With the Global Climate Action Summit in the rearview mirror, California Governor Jerry Brown signed into law SB 700 by Senator Scott Wiener (D-SF) keeping California in the driver’s seat of building a reliable and safe clean energy future. California Legislature Passes “The Million Solar Roofs of Energy Storage” Bill! Sacramento – In a broad, bipartisan victory for local clean energy, the California Senate passed SB 700 (Wiener) today with a preliminary 25-13 vote. The bill was passed by the Assembly yesterday with a final vote of 57-18. It now heads to the governor’s desk for his consideration. SB 700 would result in nearly three thousand megawatts of behind-the-meter energy storage systems at schools, farms, homes, nonprofits and businesses in California by 2026. The resulting program would be on par with the highly successful program California set in motion with the Million Solar Roofs Initiative back in 2006. "The Million Solar Roofs of Energy Storage” Passed California Assembly! Sacramento – In a bipartisan victory for local clean energy, the California Assembly passed SB 700 (Wiener) today with a 45-15 vote (at time of passage). The bill would result in nearly three thousand megawatts of behind-the-meter energy storage systems at schools, farms, homes, nonprofits and businesses in California by 2026. The resulting program would be on par with the highly successful program California set in motion with the Million Solar Roofs Initiative back in 2006. Sacramento – Standing on the steps of the State Capitol, over 200 solar and storage workers from all over California gathered to rally for SB 700 (Wiener), the bill that would replenish incentives for residential and commercial energy storage systems.The bill is considered of critical importance to helping meet the state’s clean energy goals, address grid reliability issues, and protect tens of thousands of solar jobs as so-called Time-of-Use rates hit consumer energy bills in 2019. SB 700 would re-authorize the Self-Generation Incentive Program (SGIP) for an additional five years, extending rebates for homeowners, nonprofits and businesses through 2025. It would add up to $700 million to the SGIP program, creating stability and certainty to an emerging new technology. The California solar industry supports over 86,000 jobs in the state of California, by far the most of any state in the country. These jobs are in jeopardy unless the energy storage market achieves the same economies of scale achieved in the solar photovoltaic market, which saw an 80% decline in costs over the course of the state’s 10-year incentive program, the Million Solar Roofs Initiative. This is because so-called Time-of-Use rates will make energy storage a necessity of every solar system but without cost reductions in storage, the state could suffer a setback in its deployment of solar energy. SB 700 is currently in the Assembly Appropriations committee. If it passes that committee, it will proceed to the Assembly Floor the following week. It passed the Senate last year so would only need to return for a concurrence vote before heading to the governor’s desk. After the morning rally, the solar and storage workers will fan out into small groups to meet with legislative offices to advocate for pro-solar and storage policies, such as SB 700. The California Solar & Storage Association (CALSSA) is the state’s largest clean energy business group with over 500 member companies representing an array of businesses that manufacture, design, install, finance and provide other resources to the growing local solar and storage market in California. CALSSA is the former home of the California Solar Energy Industries Association (CALSEIA). On June 20th, the California Solar & Storage Association hosted a webinar session about California’s intervening code cycle, taking effect on July 1st of 2018, allowing larger PV arrays on residential roofs as the new modified "fire setbacks and pathways" took effect. Through the link below you can view and download the webinar's slides and recording to learn about the new rules and regulations that help residential PV installers gain back valuable roof space for bigger PV arrays. The webinar also addressed the new mandate requiring inverters be certified to provide reactive power priority for the Volt-Var function. Sacramento - Thanks to the outpouring of support and leadership of author Senator Scott Wiener (D-SF), SB 700 cleared a critical hurdle today passing Assembly Utilities & Energy Committee with an overwhelming bi-partisan 14-1 vote. In committee, SB 700 was amended to become a 5-year extension of the Self-Generation Incentive Program (SGIP). SGIP is set to expire in 2020 but funds are likely to be fully subscribed next year. “SB 700 is critical to the continued growth of behind-the-meter energy storage,” said Bernadette Del Chiaro who joined Senator Wiener in presenting the bill before the Assembly Utilities & Energy Committee. SB 700 would direct the CPUC to continue the program through 2026. The program would allocate an approximate $650 million of new funds for energy storage once admin costs are subtracted. 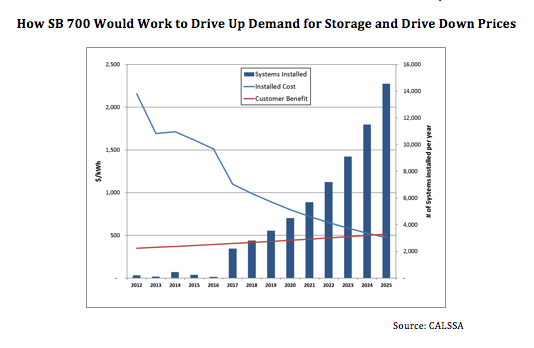 This, combined with the existing $610 million, means SB 700 would commit California to a combined $1.3 billion in storage incentives. The bill had a sprawling list of support that included 155 companies and organizations. Standing up in lone opposition to SB 700 at the hearing were the three investor-owned utilities. 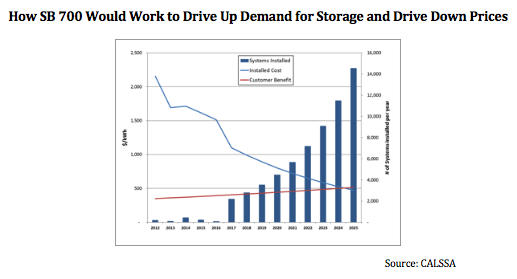 Energy storage is still in its infancy from a market perspective. It is where solar photovoltaics were in 2007. However, consumer awareness and changes to state policies are driving up demand. With the help of a longer-term rebate program, storage can flourish, providing many benefits to the consumer and to ratepayers at large. SB 700 now heads to Assembly Appropriations Committee later this summer. With a historic vote, the California Energy Commission (CEC) unanimously agreed 5 – 0 to require solar on all new homes in California starting in 2020, becoming the first state in the country with the clean energy requirement. The new rules will also include a solar plus storage option to give consumers more clean energy choices. TV interview on CNBC's Closing Bell. The event is made possible through generous contributions by sponsors and the participation of company-sponsored bands. If you are interested in sponsoring or entering your band into the contest, please contact us. Must be 21 or older to attend. Sacramento, CA – California saw a 13% decline in local solar jobs figures in 2017 according to the Solar Foundation’s Annual Job Census. The job loss was felt throughout the industry, impacting small, medium and large companies doing business throughout the state. The state industry association chalked the losses up to the negative impacts of state policy decisions while emphasizing that the ship could be righted if the state made a few corrections and got solidly behind market development of complementary technologies such as energy storage. Commensurate with the reported job losses, California saw its first decline in solar installations in nearly a decade in 2017. From January through November, California saw 1,024 MW of consumer-sited solar installed compared with 1,146 MW during the same time period in 2016. In contrast, 2016 had seen market growth from the 910 MW installed during the first eleven months of 2015. Not surprisingly, the 2016 Solar Jobs Census reported a 25% increase in jobs in California this time last year. The California Solar & Storage Association cited three main causes for the market decline in 2017: 1) heavy rains at the beginning of the year that slowed sales and construction, which could have been overcome but for the rough 2) transition to new Net Energy Metering and Time-of-Use policies, and, 3) interconnection barriers put forward by the state’s investor-owned utilities. The Association clarified that the decline could not be blamed on changing business models or market saturation. Del Chiaro cited a few things state policy makers could do to correct the market including removing interconnection barriers particularly for the commercial and industrial market, smoothing transitions to Time-of-Use rates to allow consumers to get acclimatized, and investing heavily in energy storage through tried-and-true programs, such as consumer incentives, that help drive market adoption. “There is every reason to remain bullish about the future of local solar and energy storage but we have got to get the rules of engagement right or we will all fall short of our goals,” concluded Del Chiaro. The California Solar & Storage Association (formerly CALSEIA) advances the common interests of California’s solar and storage businesses. Comprised of over 500 contractors, manufacturers, distributors, developers, financiers, consultants and non-profit organizations, the California Solar & Storage Association represents a diverse membership committed to growing the solar and storage industry statewide. The Association engages with local and state decision makers to ensure California remains a solar energy leader through sound public policy that provides clarity, transparency, and certainty for the state’s consumer-facing local clean energy market. The California Solar Energy Industries Association (CALSEIA) has updated its name to the California Solar & Storage Association. After 40 years, the organization will do business under this new moniker to reflect marketplace changes as well as a decades-long partnership with energy storage and energy management devices that go hand in hand with solar photovoltaic and thermal technologies. The California Solar & Storage Association’s headquarters remain in Sacramento, just a few blocks from the state capitol. The organization also has offices in the Bay Area as well as six chapters that gather quarterly throughout the state from San Diego to Sonoma County. The Association’s mission, board of directors, chapter leadership, staff, and its membership remain the same. The Association recently surpassed the 500-member mark, representing a diverse array of companies doing business in California. These member companies built, and in some cases manufactured, over 70% of all the local solar photovoltaic, thermal and energy storage projects installed in the state in 2017. For more information, visit us at www.calssa.org. The CALSEIA name will still conduct special educational and related activities that support the California solar market. Los Gatos, CA (PRWEB) - Adara Power, a privately-held Silicon Valley company committed to providing safe, reliable, intelligent, and connected energy storage, will introduce its new commercial and industrial energy storage solutions at the California Solar Energy Industries Association (CALSEIA) Contractor Day, January 25th in San Diego. Adara Power will lead the discussion on commercial energy storage applications and discuss the significant financial opportunities with the California Self Generation Incentive Program (SGIP). CALSEIA’s Contractor Days are California’s premier training events that bring together contractors, developers and EPCs, with thought leaders in the manufacturing, system development, and services sectors. Training topics include smart inverters, energy storage technologies, electricity tariffs related to energy storage and permitting. Adara Power is one of the leading manufacturers in the SGIP program, with energy storage systems deployed in all major utilities in California. The SGIP program can pay up to 50% of the cost of a typical project. Adara Power guides contractors, developers and end-customers through the complex process to successfully fulfill the program requirements with an accelerated timeline. Adara Power solutions reduce costs across a spectrum of today’s electrical markets, designed to counter high demand charges and time-of-use rates, while also qualifying for SGIP program, the federal investment tax credit (ITC) and new accelerated depreciation introduced with the recent tax reform bill. Adara Power clients realize short payback periods, while also benefitting from the added resiliency of backup power and sustainable renewable power. Adara Power commercial and industrial solutions are deployed on the customer side of the meter and range in size from 30kW | 65kWh to 1MW | 2MWh. Return on investment varies based on electricity tariff schedule and site electrical usage. Adara Power provides up-front bill modeling and design support for contractors, developers and EPCs and acts as their in-house subject matter experts in battery technologies. Renewable energy installers can also join the Adara Partner Program at http://www.adarapower.com. The Partner Program is designed to rapidly launch medium and large regional solar installers into the energy storage market, supplementing their solar installations and providing sales and installation training for the Adara Power solutions. Founded in 2013, Adara Power is committed to providing safe, reliable, intelligent, and connected solar energy storage for commercial and residential renewable energy. Adara Power’s Energy Storage Solutions are designed to support consumer self-consumption and enable a resilient, renewable energy grid in order to power a cleaner, sustainable planet. For more information, visit http://www.adarapower.comand follow us on Twitter: @adarapower. SACRAMENTO—The California Public Utilities Commission (CPUC) unanimously approved the new Solar on Multifamily Affordable Housing (SOMAH) Program, voting today to create a new solar rebate program for low-income and disadvantaged communities. This $1 billion program provides up to $100 million annually for ten years to incentivize installations of solar on multifamily affordable housing properties across California. Assemblymember Eggman’s bill AB 693 from 2015 created this program and is expected to help tens of thousands of low-income residents across the state receive credits on their electricity bills from solar energy. The California Solar Energy Industries Association (CALSEIA) and the California Environmental Justice Alliance (CEJA) cosponsored AB 693 to increase access to clean energy for low-income and disadvantaged communities across California. The law notably allows tenants to receive credits for electricity produced by the systems at no cost to the tenants, thereby allowing tenants to directly benefit from the solar installation. The new SOMAH Program approved today provides higher rebates for the tenant-portion of the solar system, as well as includes provisions that prohibits passing the cost onto tenants, such as increasing their rent. "CALSEIA greatly appreciates the leadership of Assemblymember Eggman to create the SOMAH Program, and the efforts of the CPUC to get this important program started," said Kelly Knutsen, Senior Policy Advisor for CALSEIA. "Our partners at Everyday Energy and CEJA were instrumental in getting us to this point. We look forward to increasing access to solar for all Californians by keeping up the momentum and fully-funding this program so we can help everyone benefit from our state’s clean energy economy." "We are excited to get to work bringing the benefits of solar PV to low-income tenants and owners. It was truly a group effort from originating AB 693, getting it signed into law, and working with the CPUC to get it implemented. CALSEIA has been an outstanding partner and has been a driving force in getting AB 693 fully funded and implemented,” said Scott Sarem Co-Founder/CEO of Everyday Energy and a CALSEIA member. AB 693 set a goal to install at least 300 megawatts (MW) of solar on affordable multifamily housing by 2030. Putting that in perspective, 39 MW of solar has been installed on multifamily affordable housing since the establishment of the Multifamily Affordable Solar Housing (MASH) Program in 2008. Berkeley, CA - On Friday, October 6, 2017, CALSEIA gave a special “40 @ 40” recognition to forty top-level executives attending the organization’s Annual Dinner and 40th Anniversary Celebration. Executives were asked to stand as a slide show played acknowledging each person before a crowd of nearly 200 industry professionals and supporters. The event keynote was delivered by Assemblymember Phil Ting (D-San Francisco) and the 40th Anniversary Toast was delivered by industry veteran Mike Emrich of Solarponics. The Annual Dinner and 40th Anniversary Celebration was held at the historical, Berkeley City Club and included a cocktail hour, a sit-down dinner and an auction. The dinner, which takes place the evening of CALSEIA’s Annual Planning meeting, has been an annual event since 2014. Acknowledging CALSEIA’s four decades of work to promote solar energy in California, Assemblymember Phil Ting gave the keynote address highlighting the importance of public policy and staying active and engaged in the state legislature. The 40th Anniversary toast was delivered by Mike Emrich who founded Solarponics in Atascadero in 1975 and has been a leader in his community and a supporter of CALSEIA for decades. Photos from the event can be viewed here and the 40 @ 40 slideshow can be viewed here. SACRAMENTO—The California Legislature passed AB 797 (Irwin) this afternoon. With the bipartisan vote in the Assembly of 45-19 today and the Senate’s bipartisan 30-10 vote on Tuesday, the bill now heads to the Governor for his signature. The bill extends consumer incentives for solar thermal technologies that heat water and air using the sun’s energy, reducing natural gas use in homes and buildings. The bill is part of the state’s ongoing efforts to meet the greenhouse gas reduction goals, improve air quality, and support economic development. AB 797 would extend the existing California Solar Initiative (CSI)-Thermal program for two years to 2020, seamlessly continuing the natural gas rebate program for homes, businesses and commercial swimming pools, such as at schools and community centers. The bill targets half of the funds for low-income housing and buildings in disadvantaged communities. It also expands eligibility for these rebates to homeowners in the San Joaquin Valley who currently use propane or wood to heat their water. Solar thermal projects installed under the CSI-Thermal program reduced natural gas use across the state by over 5.8 million therms each year, equal to the annual amount of natural gas used to heat water for over 32,00 homes. The program has offset over 31,000 metric tons of CO2(eq) annually, comparable to taking over 6,500 cars off the road each year. The Governor has until October 15 to decide on whether to sign the bill into law. The workers came to the capitol to educate legislators about the different forms of local solar and energy storage technologies including solar photovoltaic systems, solar thermal systems, and grid-tied batteries that help keep the sun shining at night. The group also honored Assemblymember Jacqui Irwin (D-Thousand Oaks) with the 2017 Legislator of the Year Award for her work to promote local solar and storage. AB 797 (Irwin) – to continue consumer incentives for solar thermal (hot water) systems that reduce natural gas use. AB 1414 (Friedman) – to extend and expand existing cap on permit fees for local solar systems. SB 700 (Wiener) – to create a multi-year consumer rebate program for energy storage. The bill stalled in July under opposition and will be taken back up in Assembly Utilities and Energy Committee again in 2018. An earlier backed bill, AB 1030 (Ting) also faced opposition earlier in the year and was stopped by the same committee. The nearly 80 businesses that participated in the day’s events came from all over California from San Diego to Redding. These businesses and 150 workers are a diverse cross-section of the 100,000 jobs that solar and storage have created across California. CYPRESS, CA - August 14, 2017 - Mitsubishi Electric US, Inc. Photovoltaic Division announced the successful test result of its Diamond Pro™ MJE photovoltaic (PV) module at 120 pounds per square foot (psf), one of the highest ratings in the industry. This test load is four times the required ANSI/UL 1703 load of 30 psf. The Diamond Pro™ was tested in both positive (snow) and negative (wind) directions based on the 2016 harmonized UL 1703 and IEC 61215 revised standard. Intertek administered the independent, third-party performance testing of product samples at its Lake Forest, California laboratory. "Together we developed a customized compliance plan for Mitsubishi Electric to meet all applicable requirements, including becoming one of the first to have product samples pass a mechanical test load of 120 psf in both positive and negative directions," said Sunny Rai, vice president of Electrical at Intertek. "They were also one of the first PV module manufacturers to test and receive an ANSI/UL 1703 Type 2 class rating." Intertek has been committed to supporting clients like Mitsubishi Electric in total quality assurance for over 130 years. "Safety and reliability have been at the forefront of Mitsubishi Electric photovoltaic products since our entry into the solar industry in 1974," said Gina Heng, vice president and general manager of Mitsubishi Electric US, Inc., Photovoltaic Division. "In accordance with our corporate sustainability goals, Mitsubishi Electric uses lead free solder, a safer option for the environment." The company's PV modules are built with a four-layer junction box with electrical connections completely encapsulated by the highest flame retardant used in the industry, UL94 V-0. Mitsubishi Electric proactively tested and passed ANSI/UL 1703 new fire classification requirements nearly a year before the 2016 testing deadline imposed by the California Building Code (CBC) and the California Residential Code (CRC). Mitsubishi Electric US, Inc. sells high quality solar panels to deliver clean, reliable energy to its customers throughout the world. With more than 90 years of electronics manufacturing expertise and 40 years' experience developing solar power technology, Mitsubishi Electric is one of the most established solar providers in the industry. Residential, commercial, and government customers can count on the 25-year solar module limited warranty offered by Mitsubishi Electric US, Inc. to enhance their return on investment. Additional information and terms of the limited warranty are available at www.MitsubishiElectricSolar.com or by calling 714.220.2500. In addition to solar modules, Mitsubishi Electric US group companies' principal businesses include semiconductor devices, automotive electrical components, elevators and escalators, factory automation products and services, heating and cooling products, electric utility products, and large-scale video displays for stadiums and arenas. Mitsubishi Electric US group companies have roughly 31 locations throughout North America with approximately 4,000 employees. Intertek is a leading Total Quality Assurance provider to industries worldwide. Our network of more than 1,000 laboratories and offices and over 42,000 people in more than 100 countries, delivers innovative and bespoke Assurance, Testing, Inspection and Certification solutions for our customers' operations and supply chains. Intertek Total Quality Assurance expertise, delivered consistently with precision, pace and passion, enabling our customers to power ahead safely. Key representatives, including Mitsubishi Electric US Inc. president and CEO Kent Hora (fourth from left), celebrate at the ground breaking ceremony for the new Budokan in Little Tokyo on August 3. AUGUST 10, 2017, LOS ANGELES, CA - Mitsubishi Electric US, Inc. pledged to donate solar panels for a 42kW solar power system to the new multipurpose sports facility and community center, Paul I. Terasaki Budokan. The donation was announced during the ground breaking ceremony in Little Tokyo on August 3. Twenty-three years in the making, Terasaki Budokan is a project of Little Tokyo Service Center. The 38,000 square-foot facility will serve youth, families and seniors. When it opens in the Spring of 2019, the Budokan will offer sports, community activities and opportunities to connect visitors to Japanese American culture and to a vibrant, sustainable Little Tokyo. In addition to the product donation, Mitsubishi Electric America Foundation, whose mission is to empower youth with disabilities to lead productive lives, will match the value of the equipment sponsorship, as well as volunteer hours for the installation. PanelClaw Inc has also generously donated the rooftop racking for this 42kW system. The system will be designed and installed by GRID Alternatives Greater Los Angeles, which makes renewable energy technology and job training accessible to underserved communities. GRID Alternatives Greater Los Angeles will train local university students with disabilities and volunteers from Mitsubishi Electric to work side by side on the installation. Mitsubishi Electric America Foundation, based in the Washington, DC area, was established in 1991 by Mitsubishi Electric Corporation and the Mitsubishi Electric group companies in the United States, which produce, sell and distribute a wide range of consumer, industrial, commercial and professional electronics products. The foundation has contributed more than $15 million over the past 26 years to organizations that empower young people with disabilities to lead more inclusive and productive lives. is a social service and community development organization that has been creating positive change for the people and places in Southern California for more than 37 years. The organization preserves and strengthens the unique ethnic communities of the region and helps people thrive. Starting with its home in Little Tokyo, LTSC builds and strengthens communities throughout Southern California where people, culture and our collective future matter. GRID Alternatives Greater Los Angeles is a non-profit organization that makes renewable energy technology and job training accessible to underserved communities. We bring together community partners, volunteers and job trainees to implement solar power and energy efficiency for low-income families, providing energy cost savings, valuable hands-on experience, and a source of clean, local energy that benefits us all.